Boat rental - group transfers for up to 120 persons per boat - cheap & quick! 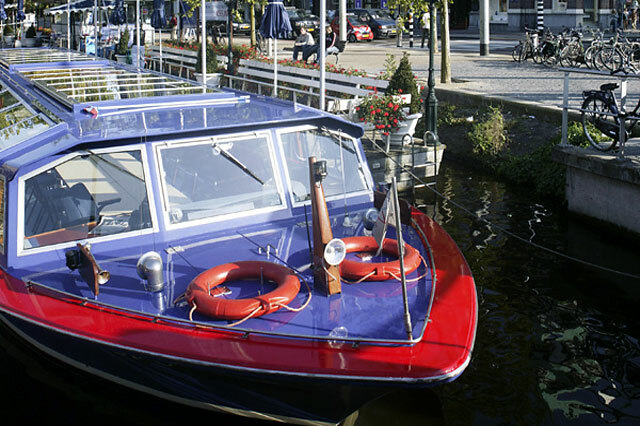 With a capacity of up to 110 persons per boat, a cruise is the quickest and cheapest way to transport your guests within the city centre of Amsterdam – and they get to see all the sights as a bonus! 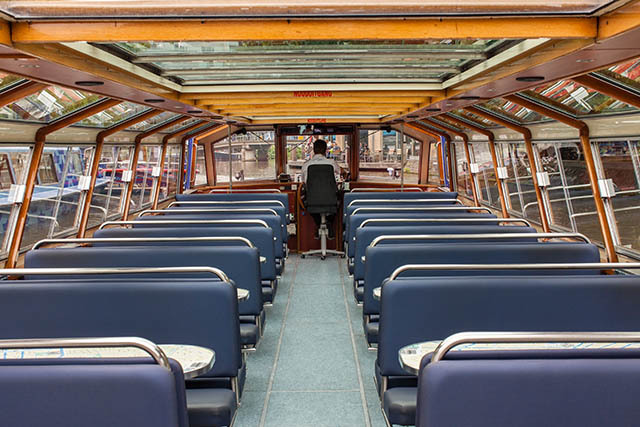 Our fleet consists of 15 large, covered canal boats. Five of our fleet are equipped with wheelchair access and two powered with electric engines. All of our boats have central heating, a toilet, a glass roof (which can be opened up to 50%), a kitchenette, bar and an outside open rear deck. They have an average standing height of 1.95 meters. 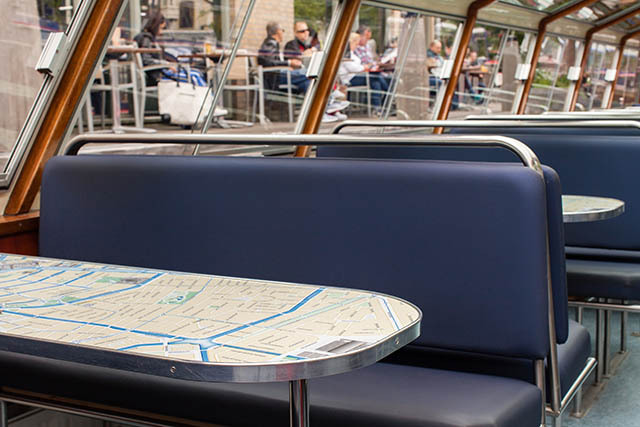 Six of the 15 boats are equipped with (r)emovable tables & chairs – which is unique in Amsterdam. All prices mentioned above are per hour and include VAT. Minimal rental time is 1,5 hours per boat. Boat rental is rounded off to 15-minute intervals. Boat rental starts when the boat leaves our docks (or when you start catering) and end when the boat is back at our docks, empty and cleaned. Boarding starts at time stated on your confirmation (no earlier). pay a catering fee of € 8,00 per person. If catering is provided by another party than Blue Boat Company, a security deposit of € 250 per boat will be charged. The security deposit & full payment need to be made prior to the sailing date. The deposit will be refunded afterwards if the boat is returned clean and on time. Of course we can also provide complete catered cruise like lunch – dinner– or drinks cruise, check these pages to see all the possibilities. From midnight to 8:30AM we charge night-rate. This consists of a 50% surcharge per hour. For hiring staff (waiters and guides), the night-rate is 150% of the daytime rate. Please note prices can vary depending on the season or events. 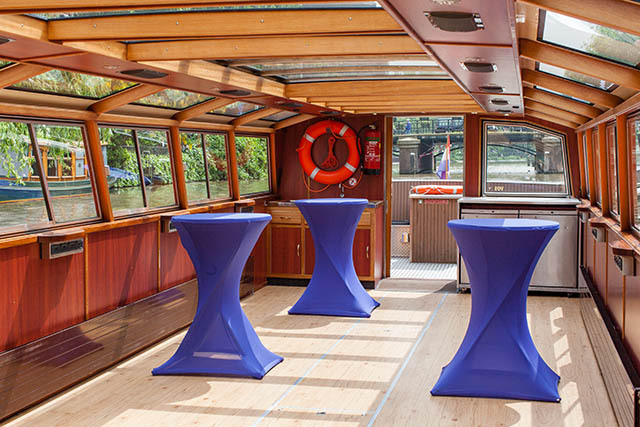 Six of our boats are equipped with flexible interiors – all tables and chairs can be (re)moved to adjust the setup. This way we can create the perfect space for your event, whether its is an informal cocktial of a business lunch.